The title of this blog post makes me think of a sappy pop song. But I like it. A few weeks ago my parents brought down a wonderful bag of treasures–little girl hand-me-down clothes. 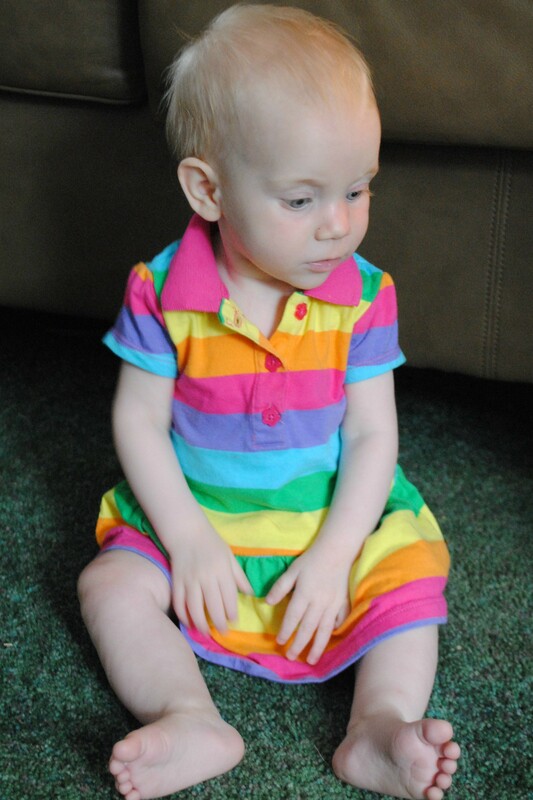 This little rainbow dress is my absolute favorite. 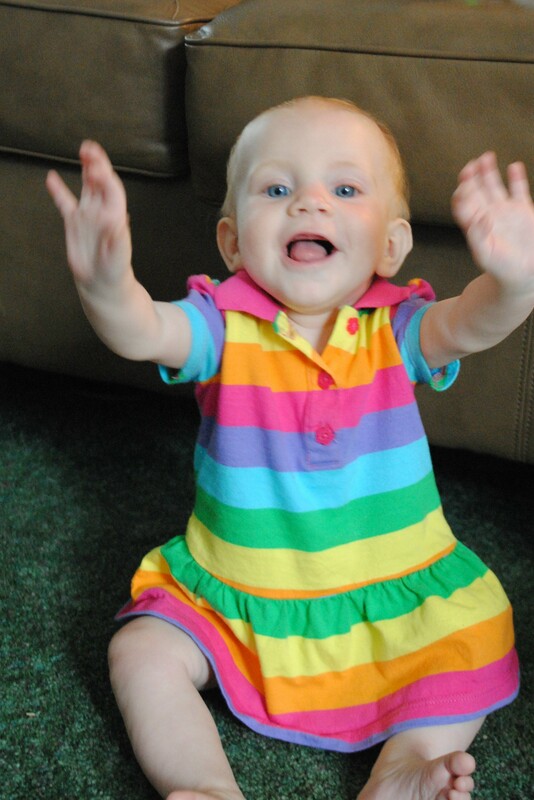 And guess what…the sweet miss wearing the dress turned 8 months old on Monday. EIGHT months. Oh my. At 8 months, our Charlotte is suddenly growing and changing so fast. In the last few weeks, she cut a third tooth, started waving, started signing “more” at meal times, and really took off with her “army crawl.” She can pull herself up to a standing position, and I’ve caught her trying to let go! Hang on, baby girl! She waves her hands to music, and she has become much more involved in our weekly Musikgarten classes. She loves the attention of her brothers, and she has become quite the Daddy’s girl all of a sudden. When Daddy gets home, she reaches for him right away. She always has a big smile for him, but she isn’t too sure about his beard. Charlotte is now eating bananas, avocados, sweet potatoes, prunes, yogurt, Cheerios, carrots, pears, and oatmeal. I think that’s her menu! Nursing is still her favorite food and her favorite activity. In just a few days, my best friend is welcoming a sweet baby girl of her own. I keep thinking of her and the joy they will share together as mother & daugher and as a growing family of four. These “baby days” are so, so special. Now, I’m getting as sappy as the title of this post (wink). i loved this post. i am a big fan of handmedowns. love consignment shops. she is a beauty and cant wait to see her at the shower! love to all. Nursing is still Lukes fave food too. haha. I love it! There are so many times that I just sit and go back in time in my mind of the younger years of my boys. So, fun. 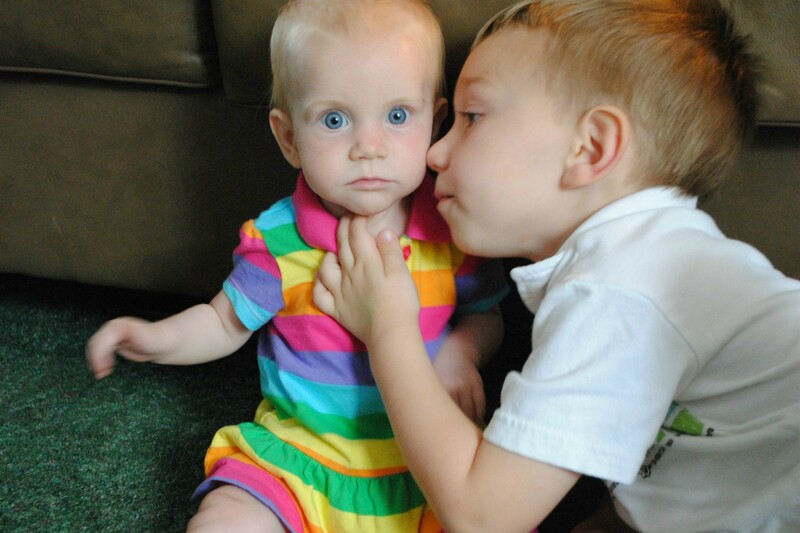 Still are fun, but there is just something extra special when they are wee ones. I just love your blog…and I love you! What an adorable dress! Love it! And I’m also a huge fan of hand-me-downs. They’re the best! Erica, so so SO cute! (the outfit, the baby, the older brother, the whole thing!) 😉 Isn’t this such a fun age? I’m discovering how much change happens in this time period, it’s amazing really!